Award-winning performance company Quarantine and Attenborough Centre for the Creative Arts bring Wallflower to Brighton this weekend, asking performers, audiences and the public 'can you remember every dance you've ever danced'? Wallflower is a marathon of dance and memory. It's a game that alters according to the players. The people on stage in Wallflower are trying to remember every dance they've ever danced. Some of them are professional dancers, some are not. Some might tell you that they can't dance at all. Quarantine have been in Brighton this month asking local residents to share their remembered dances. Records of these dances have been collected on a dedicated website – alongside remembered dances from across the UK – and will be displayed at Attenborough Centre for the Creative Arts for those attending the performances this weekend (23-24 November 2018). Spanning a lifetime of music, fashion, politics, friendships, parties, love and loss, Wallflower is a show about how dancing can shape our lives. There are memories of dancing alone all night at a party; of whirling across the stage at the Paris Opera Ballet; of silently, slowly revolving with a new lover on a canal boat at night; of a repeated tic - a bodily habit that feels like dancing; of walking alongside their mother; of racing with a dog across a beach; of dizzily spinning children; of weeping and dancing; of hitting the mark for Anne Teresa De Keersmaeker. On stage is a DJ, a disco-ball and a single chair. A performer sits in the audience, documenting every memory. To date over 2,000 dances have been recorded and added to an ever-expanding archive. ** A dance from Aden (Southern Yemen) where Laila and her family would dance together all the time. Here, in Brighton, sometimes she listens to the music of Faisal Alawi and dances it with herself. ** Terry, in his kitchen now in Kemptown, remembering a dance from 15 years ago in his kitchen then in Hackney, with his 2-year old granddaughter Jae. He had to play the song (Prince"s Raspberry Beret) again and again, because every time it finished she said "more". ** Jonathan remembering a dance that, performed with a plastic ostrich, involved the ugliest (and most joyful) shoes he has ever owned. ** Elly's 'I've got a phone in my wallet" dance, performed at the same time in five different cities beginning with B: Brooklyn, Belgrade, Bristol, Berlin and Brighton. 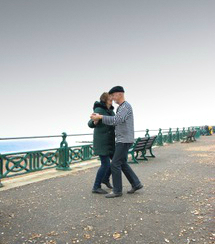 ** Charlotte and Richard waltzing on the Brighton seafront, under the stars, to the sound of a solo concertina player. ** Sally, shared a dance of herself as a 17-year old dancing with absolute abandon for the very first time to I feel free by Cream. ** Marco shared his first dance with his now husband, in London, on New Year's Eve 1993/1994. Marco is hearing and Italian. John is deaf and English. This dance was the beginning of them finding a common language together. "As we look at the portrait of another, we might also somehow see ourselves. I'm drawn to the difference between what we think we"re showing and how we're being seen. "Dance appears to be a potent way to do this – it's familiar to us all, whether we choose to sit on the sidelines or jump right in." Wallflower at Attenborough Centre for the Creative Arts on 23rd November: 8pm-9.30pm and 24th November 2018: 3.30pm-8.30pm. For more info CLICK HERE.